However, factors such as high prices of lithium-ion batteries that make them unsustainable for prolonged use such as in electric vehicles and their lower thermal stability are restraining the market’s growth. The report also offers assessment of different drivers that is impacting the global market, along with the restraints and opportunities that has also been covered under the scope of this research. For each segment (such as power capacity, pack type, shape and application), market dynamics analysis has been provided. All these factors help in determining different trends that has been impacting the overall market growth. 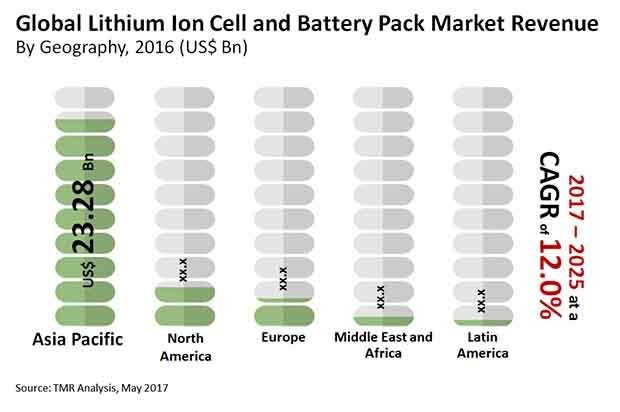 Moreover, after taking into consideration all this factors, an extensive analysis of the region wise growth parameters of lithium ion cell and battery pack market along with the overall assessment for the forecast period of 2017-2025 has been also been provided within this report.Moreover, the report includes the patents analysis is also included in the scope of the research. The consumption of lithium ion cell and battery pack for the alternate fuels in commercial vehicles and increasing sustainable practices in organizations are generating positive outlook for lithium-ion batteries.Lithium-ion batteries are increasingly getting utilized in the many energy plants, companies and campuses as the source of clean power. The government restriction on the use of natural resources causing carbon emission has helped in the shift of temperament from petroleum fuels to clean fuels. These fctors are drvining the market for lithium ion cell and battery pack market globally. The lithium ion cell and battery pack market is growing rapidly driven by the demand from electric vehicles sector. In addition, lithium ion battery have huge potential in the handheld devices for satisfying the increasing demand of high power density required for wireless transmission of data and brighter resolution. These factors raecontributing in the positive development of the lithium ion cell and battery pack market.other industrial hand-held devices such as GSM/GPRS and RFID communications, LED flash, thermal printers, bar code scanners, display refreshes, GPS chips, hard disk drives and audio amplifiers can also be operated more efficiently with the help of lithium ion battery. Increasing adoption of lithium ion batteries in different industries are having a positive impact on the market ans is anticipated to positively impact the over the forecast period. Based on power capacity, the market for lithium ion cell and battery pack has been segmented into 5–25 Wh, 48-95 Wh, 18-28 KWh, 100-250 KWh, More than 300 KWh. By pack type, the market for lithium ion cell and battery pack has been segmented into Series Battery Pack and Parallel Battery Pack. By battery shape, the market for lithium ion cell and battery pack has been segmented into cylindrical, prismatic, polygon, coin among others.On the basis of application, the market has been segmented into consumer electronics, automotive, medical, grid energy and industrial among others.By geography, the market is segmented into Europe, Asia Pacific, North America, Latin America and Middle-East & Africa (MEA). By revenue, Asia Pacific accounted for the largest share in the lithium ion cell and battery pack market in 2016. Some of the leading players in the market are Samsung SDI Co. Ltd. (South Korea), Panasonic Corporation (Japan), LG Chem Power, Inc. (The U.S.), Toshiba Corporation (Japan), Hitachi Chemical Co. Ltd. (Japan), Automotive Energy Supply Corporation (Japan), GS Yuasa International Ltd. (Japan), Johnson Controls, Inc. (The U.S.), Shenzhen BAK Battery Co., Ltd. (China), Future Hi-Tech Batteries Limited (India), BYD Co. Ltd. (China), Tianjin Lishen Battery Co. Ltd. (China), Amperex Technology Ltd. (Hong Kong), Hunan Shanshan Toda Advanced Materials Co. Ltd. (China) and Pulead Technology Industry Co., Ltd. (China) among others.